Suzuki's Indian unit, which sells vehicles like this white Swift, is targeting India's at least 700 million rural residents. (Bloomberg) -- Maruti Suzuki India salesman Ram Krishna Upadhyaya goes to a farmers' market three times a week to find out who has had a good crop and can afford a new car. Maruti, the country's largest carmaker, more than doubled rural sales last year as Upadhyaya and 4,000 other agents used a personal touch in villages where televisions and newspapers are a rarity. The Suzuki Motor Corp. unit has built a network targeting India's at least 700 million rural residents as General Motors Co., Volkswagen AG and Tata Motors challenge Maruti's grip on cities. 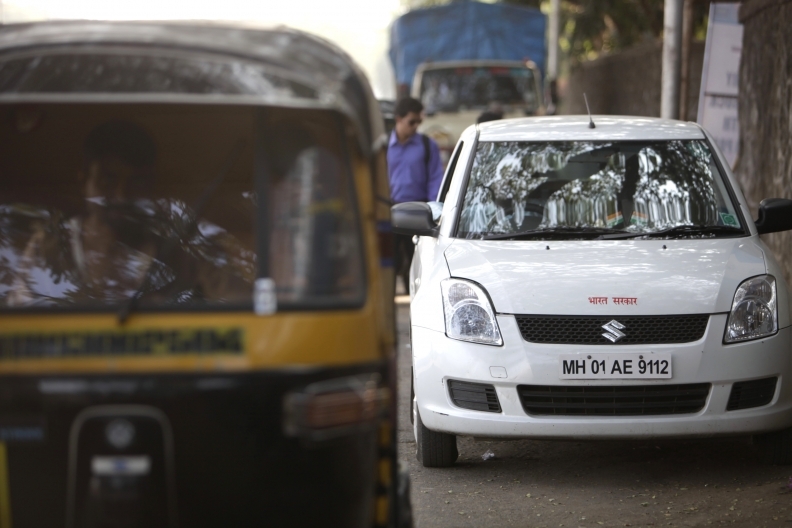 India's nationwide auto sales increased 25 percent to 1.53 million in the year that ended in March, with New Delhi-based Maruti accounting for half the market. Sales may reach 3 million units by 2015, according to the government. Maruti increased the proportion of sales it got from rural areas to 17 percent in the year that ended in March from 4 percent two years earlier. The secret? Reaching out to villagers who hadn't previously considered owning a car, said Mayank Pareek, managing executive officer in charge of marketing and sales. “We found that many people in villages don't feel comfortable going to an air-conditioned showroom and talking to a salesman wearing a tie,” he said. “We have seen only the tip of the iceberg” in terms of rural sales. About half of India's more than 600,000 villages didn't have all-weather roads as recently as five years ago, Pareek said. But Prime Minister Manmohan Singh is boosting spending on agriculture and rural infrastructure under the “Build India” campaign, designed to create jobs and improve living standards. In China, government efforts including vehicle subsidies helped rural auto sales growth outpace urban areas for the first time last year, according to the nation's commerce ministry. China passed the U.S. as the world's largest auto market in 2009. Across India, Maruti has 812 dealers, who can operate more than one outlet. Upadhyaya runs a small showroom near Mankapur and also displays cars under a tent each week at the farmers' market. He sells about 10 cars a month, he said by phone. Sugarcane farmer Karta Ram Paswan bought an air-conditioned Maruti Alto hatchback, which starts at 269,713 rupees ($5,800), after Upadhyaya invited him to view cars at the market and helped arrange financing. Maruti faces rising competition, including from Tata, which is working through 100,000 advance orders for the 123,360-rupee ($2,600) Nano, the world's cheapest car. Other automakers are also pushing into rural markets amid increasing competition in Mumbai, New Delhi and other cities. GM plans to have 300 dealerships and a similar number of service outlets in India by the end of the year, up from around 200, said Karl Slym, the head of its local operations. The company expects to open 60 percent of new dealers in towns of 500,000 people or less, he said. Particularly in small towns, the carmaker wants dealers who are “connected locally,” he said. Volkswagen, which has 43 dealerships in India now, aims to have 120 by 2012. It began selling the Polo, which costs 434,000 rupees ($9,200) in New Delhi, earlier this year. The carmaker will decide whether to move into rural areas after meeting demand in cities, it said in reply to Bloomberg News' questions. Ford Motor Co. has invested $950 million in a factory in Chennai and introduced the 350,000-rupee ($7,500) Figo this year. It also opened 28 facilities in 24 cities on a single day in February. It aims to have 200 dealerships and service stations by end of the year, from 164 in 97 cities now.